Beach bums and vacation junkies alike will all get a big kick out of our new relaxed Beach Gnome! 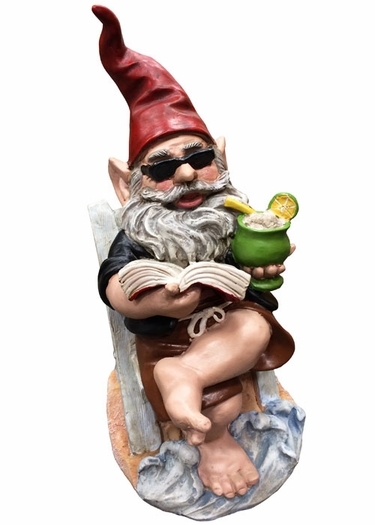 Kicking back in his beach chair on a mound of sound, the tides of the ocean reaching his feet, a book in one hand and margarita with lime in the other, this Beach Gnome has so much detailed design he will blow you away! Our new Beach Gnome Collection is already a hit, and looks great in any garden, beach house, by the pool, or any other fun place you need a little vacationing atmosphere. Made of durable weather-resistant cast stone resin. Mankini Gnome Statue - 12" OMG!